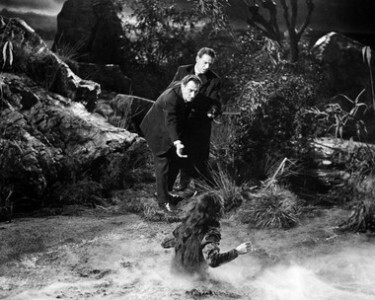 I love these Hammer Horror Films – and particularly this one. When we get the flashback in the very early stages of the film, to the Princess Ananka being buried many years ago and Kharis High Priest with a dark secret – his love for the princess – it really sets the scene for us as we settle down for the action to come. 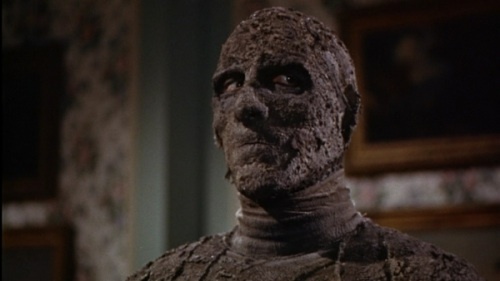 Whilst excavating the ancient site in Egypt, Peter Cushing’s father played by Felix Aylmer, picks up and reads the scroll of life and The Mummy stirs, this sequence is very erie – sending Felix Aylmers character- Banning - mad – to such an extent that on his return to England he is committed to a lunatic asylum where eventually he comes face to face with The Mummy. Peter Cushing and Christopher Lee. After the early sequence in Egypt we return to England, in 1898: For three years Banning has been confined to a mental asylum unable to communicate with anyone. One day his son John (Peter Cushing), now happily married to the beautiful Isobel (Yvonne Furneaux), is summoned to the asylum at his father’s request. The old man, having suddenly regained the power of speech, warns his son of impending doom. Kharis the mummy will soon come to kill him; John and his father are also marked for death for violating Ananka’s secret resting place. Heartbroken about his father’s condition, John chalks it up as the ravings of a madman. 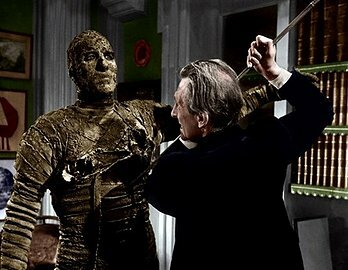 He begins to realise differently when an The Mummy smashes into the elder Banning’s padded cell and strangles him. In a search for answers John and his uncle begin pouring through the old man’s papers. Meanwhile, Mehemet Bey played by George Pastell , a secret acolyte of Karnak who’s made a sacred vow of revenge for the desecration of Ananka’s tomb — prepares for vengeance. The sets and production values for this film are very high even though the budget must have been limited. Christopher Lee brings a measure of sadness to the character of Kharis / The Mummy because of his great love for the Princess Ananka. 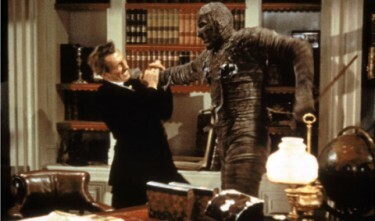 In a thrilling sequence The Mummy breaks through the glass doors of Peter Cushing’s home and proceeds to try to strangle him. He is saved by his wife who enters the room and she bears a striking resemblence to the Princess Ananka. Kharis the stops and looks at her and departs the scene. This is a good well made film – I must watch it again soon – and one which is recommended. It is in my view probably the best of the Hammer HorrorFilms. Yvonne Furneaux plays Peter Cushings wife and the Princess Ananka. Christopher Lee made his film debut in 1948 in Corridor of Mirrors which was directed by Terence Stamp and made in Paris. He was also in Scott of the Antarctic shortly afterwards. Much more about Christopher Lee and Peter Cushing in later posts as these two hold a unique place in British Film History.